Things are looking grim for GI Joe Kre-O. The entire line was already a Toys Я Us exclusive, the sets are being put on clearance, and after it took a year for Series 3 of the blind-bagged Kreons to follow Series 2, it seemed Series 4 would never materialize. But then one day, randomly dumped loosely on the shelf behind the Series 3 box, was... wait, Series 5!? 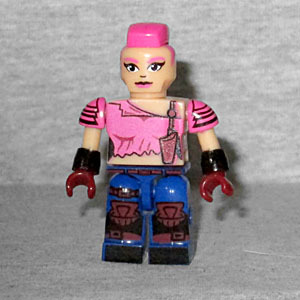 GI Joe Kreons don't get the kiddified biography info the way the Transformers initially did, but if they did, Zarana's would probably be about how she's perfect at imitating people, but can't do it for long because she thinks it's more fun to make fun of them. That's pretty much straight from her original filecard! And make no mistake, this is the original Zarana, not the G2 redesign. She's wearing her torn pink shirt, and her shoulders are painted with armor - they should have gone with the angular "Transformer" arms instead of the round "human" ones. She has a holster painted on her chest and apparently acting as the only thing holding her shirt up on that side. Then she's either got tattoos or scars or something on her shoulderblade back there - if they're just supposed to be anatomy, they probably shouldn't be bright pink. The paint apps on her legs are very complex, to best re-create her boots and kneepads, and she's been given Ripper's mohawk (again, in pink) to complete her classic look. 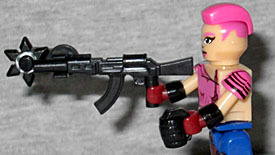 Zarana comes with her favorite weapon, the war saw. It's not a single item, but rather a thing that you build from four pieces: a ninja star, a machine gun, and two connector bits. It's impressive how well the whole thing comes together. She also comes with a Kre-O grenade, which is nice enough, but thanks to the little handle that allows her to hold it, it ends up looking more like a tiny black coffee cup than a destructive weapon. After Series 3, Hasbro stopped printing identification codes on the GI Joe Kreon bags, so our decoder was useless. You just have to molest the bags, hoping to feel her mohawk through the plastic. There are a lot of characters in Series 5 I would have gotten if I could have reliably identified them, but since I couldn't, I'm just lucky to have found Zarana. I found a bunch of Battle Damaged BATS feeling the drill in the bag, I have like 5 I think. I was lucky enough to nab the one fig I was missing, then I found two of them, the Techno Viper. i don't buy these but i think they're cool. at least they're in series 5.